The Activity employs an engaging thought experiment to help the reader "visit a classroom" to understand how the lesson used to introduce the concept or skill would materialize in the class. The Mathematics provides the necessary mathematical background used in the lesson to make the actual teaching/learning situation comfortable for both the teachers and the learner. The Plan provides the reader with an actual lesson plan to engage the Activity in the classroom setting. Putting It All Together pulls the previous sections together with a summary of the chapter as well as further information for making the lesson successful. 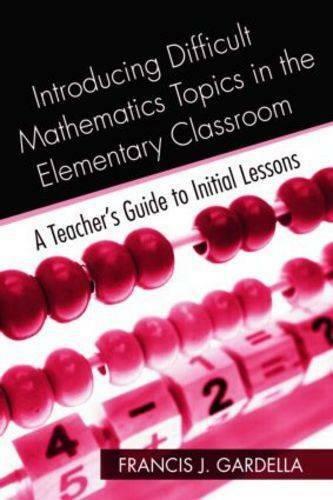 By providing models of what excellent lessons on a given topic look like, knowledge of the mathematics involved, and a concrete lesson plan structure this much-needed resource is the definitive mathematics planning vehicle that every teacher will want before they set foot in their own elementary classroom.